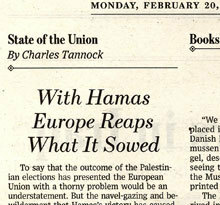 Tory MEP Charles Tannock has tackled the issue of Hamas’ rise to power in today’s Wall Street Journal Europe. "The EU’s reluctance to confront the rampant venality in Yasser Arafat’s Palestinian Authority — indeed, the way Brussels tacitly encouraged that corruption, maybe hoping the PA could be bribed into a peace deal — is largely what has led to this point. The fact that we knew of Arafat’s cronyism and still funneled rivers of cash into his pockets makes the EU complicit in this corruption and ultimately also in the election of Hamas. Hamas surged to power thanks in part to the grievances of Palestinians who saw Fatah leaders grow fatter on donor money — including 280 million euros a year from Brussels alone — while their poverty and misery steadily worsened. Hamas successfully filled the void by providing many charitable services and skillfully using the mosque to push its political agenda. Europe is reaping what it sowed. Palestinian corruption was the elephant in the room at the European Commission. Indeed, when I and other MEPs pushed for a European Parliament investigation into it three years ago, Chris Patten, then the external relations commissioner, memorably told us he needed such an investigation "like a hole in the head." The inquiry resulted in a whitewash and MEPs were never allowed to debate its findings. Chris Patten moved on. Many more Israelis died in suicide bombings." Mr Tannock’s conclusion is that if the EU was to send "so much as a penny to a PA led by an unreformed Hamas, we would be showing that we have learned absolutely nothing from our mistakes."